The extended deadline for the next review cycle is now May 17, 2019. SPARC Program Purpose: To "spark" IASWG members' innovative practice, education, training and research projects through endorsement and small grants to advance the IASWG mission. 2018 is the IASWG SPARC Program’s 6th year of operation. We are proud of all the IASWG SPARC Projects Endorsed and Funded during our first 5 years of operation, and encourage IASWG Members to submit proposals for the current review cycle ending on May 17, 2019. You must be a current member of IASWG to apply. Potential applicants should review the Application and SPARC Project Agreement. Since 2013, we have had 10 SPARC Program review cycles, and the IASWG Board has endorsed 30 projects, 18 of them with funding totaling $13,370.00. Our current funding levels range from $250 to $1000 per grant. Thus far, we have SPARC Projects on three continents! Information on our previous awards is available below. Applications are reviewed twice per year, in advance of the IASWG Board Meetings, generally held in June and November. The next deadline is May 17, 2019. Awardees will be announced in May at the IASWG Board Meeting. The committee members are: Carol Cohen, Barbara Muskat, Zaneta Smith and Brian Kelly. Please contact Carol Cohen ([email protected]) for further information. See Videos from IASWG SPARC Awardees, talking about their SPARC Projects, why they applied to SPARC, and their advice to new applicants. Summary: The Psychosocial Support Group in Refugee Transit Camps Project is a response to growing recognition of the need to promote psychosocial wellbeing for refugees during their forced flight, in accordance with United Nations High Commissioner for Refugee (UNHCR) recommendations to integrate mental health and psychosocial approaches into its protection activities. The proposed project includes (1) development of a 6-session manualized trauma-informed, psycho-educational and support group model for refugee transit camps, (2) training and implementation support for Ugandan social workers from organizations in Nyakabande Transit Camp along the Uganda-DRC border, and (3) evaluation of the group model and recommendations for replication in other transit camps. The model aims to enhance refugees’ awareness of psychosocial well-being, to build on resilience by expanding distress management skills, and to promote community-building in order to reduce isolation. Group clients will be adult refugees who have recently experienced war, violence, threats, and other human rights abuses. Summary: This pilot study assesses the effectiveness of the Interpersonal Classroom Model (ICM) as a teaching approach within an MSW Diversity and Social Justice course. Previously, the ICM approach was tested within a year-long comparison study involving four undergraduate group practice courses (Tyler, in press). The ICM approach demonstrates preliminary effectiveness as a promising new method for preparing students for group leadership when working with diverse client populations. This project seeks to build on current ICM development by accessing whether this approach can be implemented within an MSW course. This project aims to support educators seeking to help students learn from diversity existing within the classroom. Students will complete a weekly ICM survey that requires them to access their experience during an ongoing in-class process group, and at four different times, complete a new survey titled the “group leadership assessment”. Summary: The LGBTQ Youth Affirmative Mindfulness Group Project is an exploratory constructivist grounded theory dissertation study on social group work with LGBTQ youth. This study will utilize 3 focus groups with approximately 16-20 LGBTQ youth (ages 16-18) to examine the potential utility of an adapted group affirmative mindfulness-based intervention (MBI) for LGBTQ youth. The study aims to: 1) Introduce and practice core mindfulness skills in a group setting with LGBTQ youth to understand and experience mindfulness; 2) Investigate what mindfulness and affirmative content and skills are useful for a culturally-relevant adaptation of a group MBI for LGBTQ youth; 3) Based on LGBTQ youth feedback, develop an adapted group mindfulness and affirmative manualized intervention for LGBTQ youth to enhance mental health support. As the cultivation and understanding of mindfulness involves an experiential approach, it must be practiced to be fully understood (Kabat-Zinn, 1991). Core mindfulness skills will be introduced and practiced in a group setting with LGBTQ youth, drawing from the Mindfulness-Based Stress Reduction for Teens (MBSR-T) intervention (Biegel, 2017; Biegel et al., 2009). Initiative to expand support group work services and training with media capabilities. Dissertation study of factors in the commitment to group work practice. Project to compile case studies for group work teaching and training. Research to study authors' trajectories following their group work related dissertations. Training to expand staff expertise in providing diverse group work programs. Innovation to expand knowledge and competency to more effectively serve an under-served population. Dissertation study of school social workers' perceptions of grief counseling groups for adolescents. Development of group work programs to better serve youth and young men of color. Large scale research study to examine and work more effectively with diversity in group work throughout stages of development. Implementation of an innovative book discussion group with members with multiple sclerosis. Evaluation of small group activities within online learning environments. Research and training in group work supervision. Advocacy for the use of group methods in social work and allied fields. Examination of the linkage of summer camp programs and the development of social group work. Establishment of a think tank & action network to challenge and eradicate the oppressive social structures threatening young Black males. Implementation of a stigma focused group program, collaboratively developed for and with parents living with HIV. IASWG members are welcome to submit proposals to the SPARC Program, requesting endorsement with or without funding, for special projects (e.g., training, research, and practice) consistent with the mission of IASWG. All proposals should be sent as an email attachment to [email protected] Please feel free to contact Carol S. Cohen at the above email address or by phone at +516.877.4427 to discuss the Program with a member of the SPARC Committee. 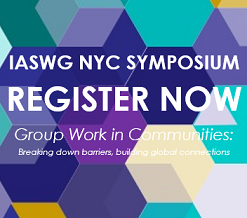 Final Report of Great Conversations in Social Work: Using Groupwork to Promote Inclusive Dialogue and Collective Action Around Social Justice, Stacy Gherardi &​ ​Maria Gurrola, (2017 IASWG SPARC Endorsement and Grant).